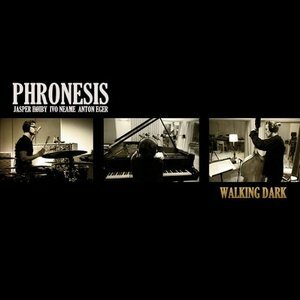 Having topped numerous 'album of the year' polls with their 2010 live album, Phronesis have returned to the studio for this, their fourth recording as a trio. Named Walking Dark to refer to their practice of playing occasional concerts in total darkness ('a way of giving something positive back to my sister, who continues to walk in darkness' according to bassist/leader Jasper Høiby – cf. an earlier release, Green Delay), the album departs somewhat from customary Phronesis practice by sharing the composing duties around the band, rather than relying exclusively on Høiby himself to come up with their pleasingly nervy, groove-based pieces. The result is a slightly more wide-ranging set than usual, pianist Ivo Neame and Swedish drummer Anton Eger providing six of the album's twelve tracks, but the band's trademark sound – an irresistibly propulsive, often downright joyous but consistently musicianly controlled vivacity – remains unchanged. Their practice of stating many of their pieces' tricksy themes by having bass and piano play them in unison immediately arrests the ear, but it is the sheer quality of the trio's individual and collective contributions that rivets the attention throughout. Høiby is one of the most arresting bassists on the contemporary scene, his sound at once lithe and sonorous, his solos compulsively listenable, and with the unshowy but fluent piano of Neame and the cracklingly energetic drumming of Eger driving the band, Walking Dark is Phronesis's most accomplished album to date.